Property 1: Beautiful Caribbean Mansion, Located in the village of Upper Fairhall. Property 3: Luxury 5* villa with private pool amazing views, perfect for 2 or 4 guests. Burke House’s private setting is relaxing, romantic and includes personal cook. Property 7: Burke House’s private setting is relaxing, romantic and includes personal cook. Property 8: Calmando. Enjoy some of the best oceanfront views Crown Point has to offer. Property 19: WALK TO TOWN! RIGHT IN TOWN EASY ACCESS TO EVERYTING KINGSTOWN! Property 21: KINGSTOWN 2 BEDROOM RIGHT IN TOWN! WALKING DISTANCE TO EVERYTHNG VINCY! Property 37: One of the most beautiful views of the island! 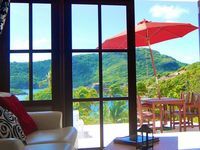 Property 46: Moondance Hideaway, Bequia. Where Angels come to rest. It was always kept very clean.